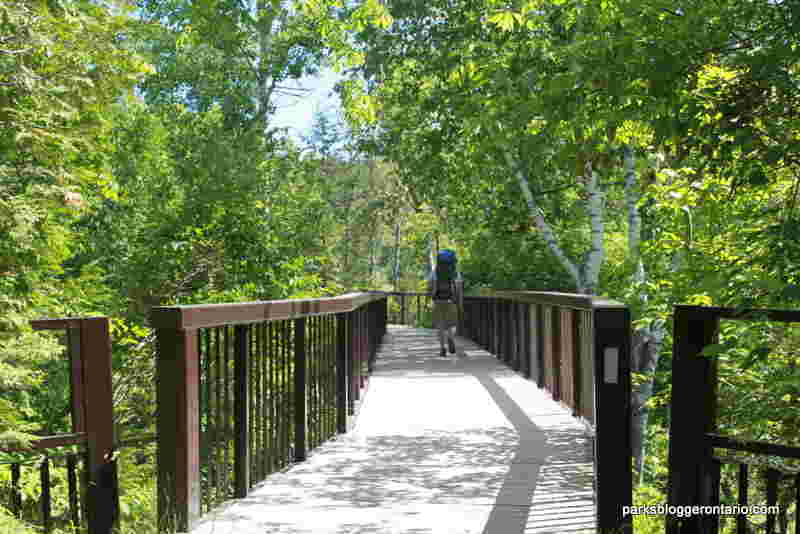 The Forks of the Credit Provincial Park is located in the heart of the credit valley. This compact park is a haven for hikers with several trails featuring various terrains ranging from rolling fields to rocky dirt paths. I recently had the pleasure of taking to the trails on a bright Sunday morning. We arrived at the park at 10am. The weather was perfect not a cloud in sight. We started at the Meadow Trail which leads to the famed Cataract Falls and a platform lookout point. The hike starts with the dirt path taking you though various rolling fields. I found it to be a cheerful view especially on a sunny day. This is the trail head at the park entrance featuring the Trans Canada trail and the Meadow Trail. Trail conditions on the Meadow Trail are easy with a nice solid path, clear of debris. The path is a mix of dirt, sand and grass. Due to the low number of trees on the trail a hat and a good amount of water are a must on hot summer days. Kettle Lake is the first water feature on the Meadow trail. The Kettle Trail connects the Trans Canada to Meadow Trail. A nice short trail that is perfect for any individual with a hankering for a good view but short on time. Like many parks along the escarpment this park has the Bruce Trail running through it. 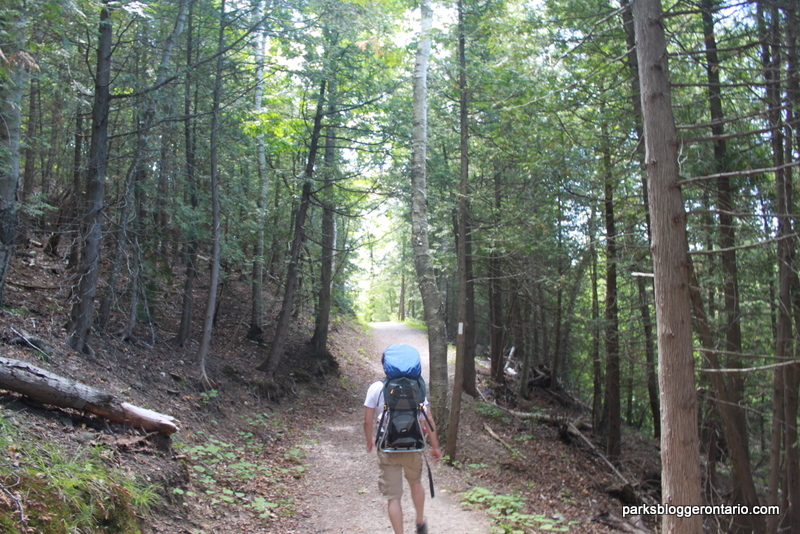 We hiked along the Bruce trail. It took us through some nice wooded areas along the banks of the credit river on the valley floor. The trails are clean and though as most parks garbage cans are mostly at the entrance. So everything you bring in you must take back with you. The most rigours part of our hike was the Bruce Side trail connecting the Dominion Path to the Meadow Path forming a nice loop of the two trails. The path is moderate in difficulty with some mild elevation and rocky areas. This path takes you hiking up the valley escarpment, though not very strenuously as my hyperactive 2 year old daughter climbed the side trail without any assistance. The trails are a great workout and highly recommended for trail running enthusiasts. Hiking shoes or Trail runners are strongly recommended with traction. We completed the park in roughly 2 hours walking about 6.2 km with the children in tow. The Dominion Trail takes you along the credit valley. The path consists of gravel and rock. 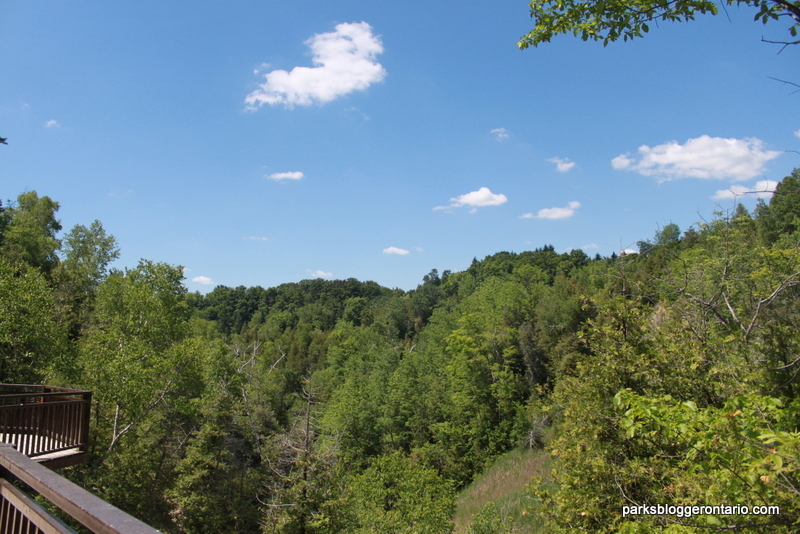 The views are a real treat for the eyes featuring the likes of the credit river and surrounding Niagara escarpment. We also found this area swarming with flies and mosquitos. Wearing proper clothing and bug spray will keep those pesky buggers away. Cataract falls is the main attraction visible from a rustic wooden bridge. We discovered that in reality the heavy foliage blocks the falls from view. The views from the trail were still worth the hike. There is something about nature that keeps us wanting to come back. Regardless of whether it is an evolutionary response to the lack of green in our modern lifestyles or a sense of achievement in conquering the great outdoors, we need nature. The vegetation of Forks is typical to southern Ontario with an abundance of popular, maple and some birch. Wild flowers are also abundant in the spring/ summer season. Overall the Park is a nice city escape located less than an hour north of Toronto. The path is accessible and good for hiking with kids. It provides some nice view and an easy hike in a relaxing atmosphere. Forks of the Credit is the perfect half day getaway from the concrete jungle for nature lovers of all ages. The Parking fee is standard for a provincial park, coming in at 14 dollars for a day pass. This was a great park for kids. My two year old daughter was happily running along the trail and picking up sticks to play with. Some trails are stroller friendly such as the Trans Canada trail, kettle trail and the first half of the meadow trail as long as the stroller can handle all terrain. A child carrier would be more efficient for children under the age of 3. Dogs are also welcome at the park. We passed a few four legged companions mostly on leash. Unfortunately some individuals feel the need to bend the rules under the impression that Fido is more trained than the rest. 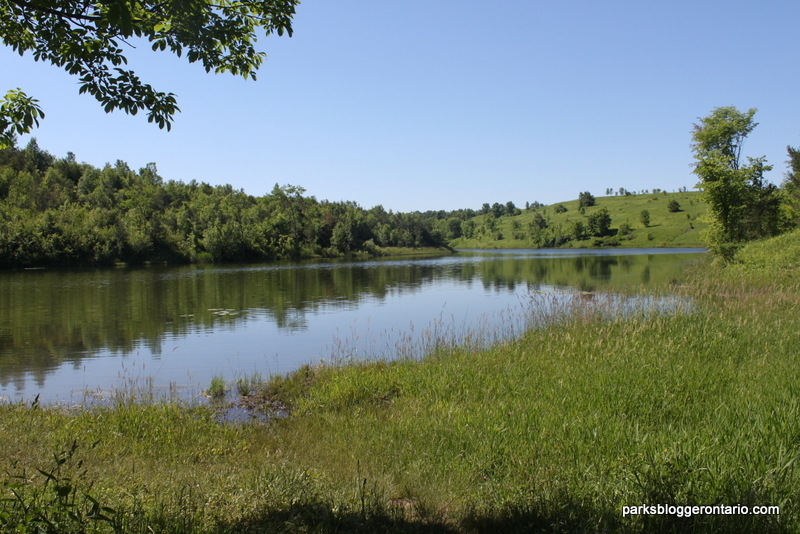 Forks of the Credit Provincial Park is home to various activities for nature lovers to take part in. This park is open during all four season with lots to do. During the long cold winter months the park turns into a winter wonderland facilitating cross country skiers on groomed paths. Sledding on the rolling hills is a popular activity for the younger folk as well as snowshoeing on the snowed trails. Once spring hits fishing is another activity the park is known for and attracts a number of hopeful anglers. Rainbow trout and Chinook salmon are just some of the prized fish calling the Credit River home. Mountain biking is also allowed on most trails. Many people enjoyed this activity. During summer, the credit river becomes natures very own waterpark as people take the river sliding down rocks and splashing in the shallows. Swimming in any river should be done with great care.